I have just returned from the biggest Big One show in history. This year there where more stands and more visitors than ever before; which is testament to how well the show is organized and publicized. The show is held at Farnborough Airfield near London. If you have never been before it is well worth the trip! 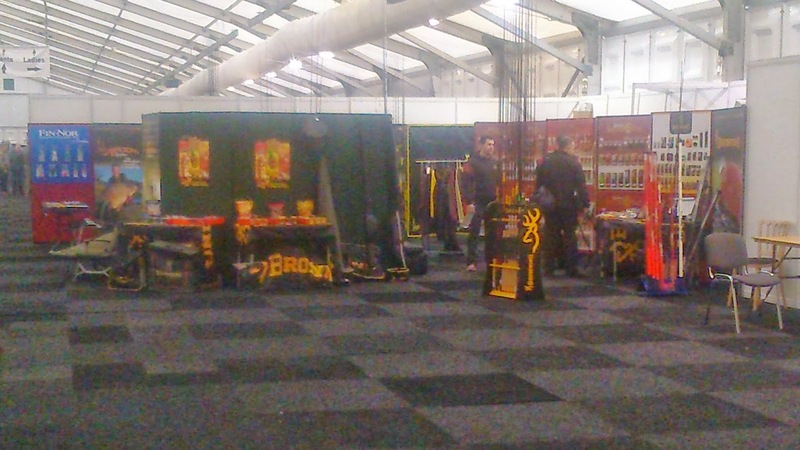 I spent the full weekend at the show splitting my time between the 2 Browning Zebco stands, which consisted of the Main Stand and the Pole Alley Stand. The Main stand this year was bigger than last year, with more products on show from all the Zebco brands. These included Quantum, Black Cat, Radical and Rhino. If you love your specialist angling, then the tackle these companies supply is well worth a look at. More information can be found by logging onto the Zebco website. 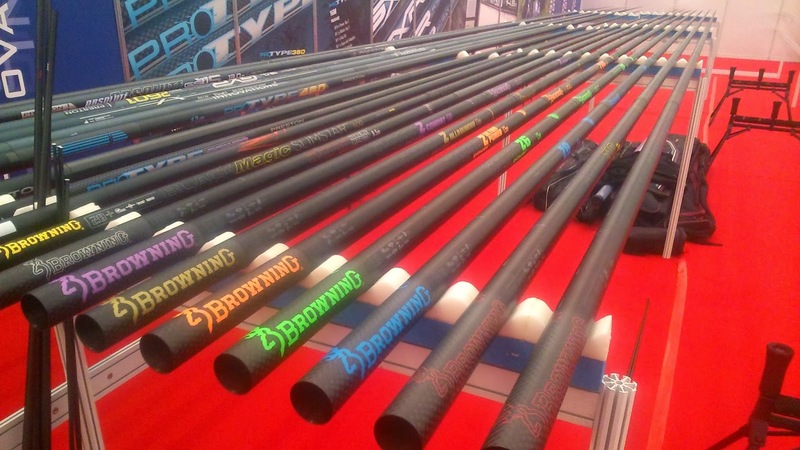 Browning had the largest amount of products on show, which ranged from terminal tackle to luggage. The newly designed luggage with its sleek modern design and totally new material is sure to be a hit. The range covers Holdalls, Carryalls, Ready Rod Cases, Feeder Bags and Bait Bags. in other words every thing you need. The most talked about new product on show seemed to be the Xitan MF reel which is an awesome piece of kit. It has a large diameter spool (a must for today's match angler). It has a ultra smooth and progressive carbon drag system, perfect if you like to play fish on the drag The line clip has been specially designed with a protective coating to prevent line damage, which is essential, considering how much it is used in this day and age. The reel also comes supplied with a single and double handle. The reel is also available in 2 sizes 930 and 940. These are really good value considering the quality and performance they provide! The Xitan Z10 is the new younger brother to the mighty Xitan Z12, and has been designed using the same Mandrel as the top of the range Z12. The core design is identical and has all the advanced features of the Z12; however the the sections are constructed using a different mix of Nano-carbon. 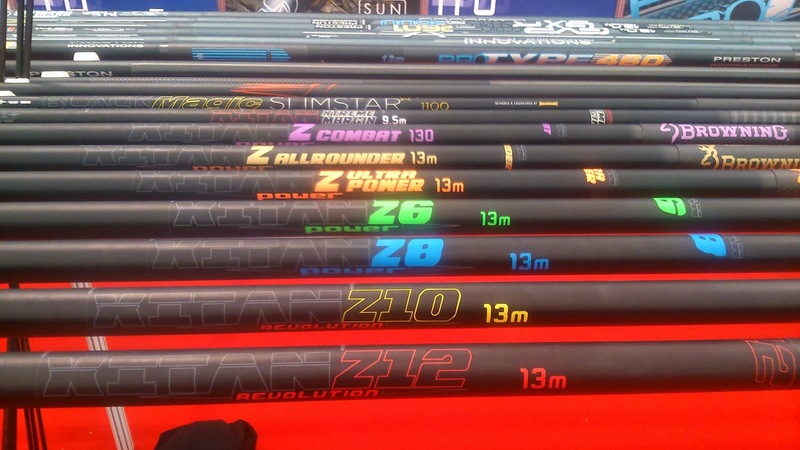 The result is a high performance pole for anglers that want or need an extra degree of strength and durability in their top end pole- or perhaps a lower cost than a Z12. As with the Z12 and the Z8 you get to choose which top kits suit you. You have a choice of tip diameters 3.0 mm, 3.9 mm, 4.5 mm and 5.5 mm . You then get the choice of standard kits or Tension Puller kits or if you select it, a mixture of both. No other pole manufacturer offers this choice. The pole also comes with 3 pole protectors, which come with built in skid bungs. The pole protectors are are all reversible and fit from the 5th section down. Again no other manufacturer does these! As with the Z12 the Z10 is available in 2 packages. For any further information on these or any other Browning products then please click onto the Browning products section on the header bar. For the further details, please click on the catalogue section on the side bar. I hope to be there next year and can imagine the show been even bigger and even better. If you have never been before, then plan it in for next year. I am sure you will not be disappointed.